This past summer was fun. Full of camping trips, picnics, road trips, hikes, and plenty of lazy days. Fall has been pretty amazing, too -- vacations, birthdays, milestones, and, of course, Halloween. And I have slacked (yet again) here on this blog of mine. For, like, almost six months. I'll be honest, I wasn't sure if I'd be able to come up with another list. I mean, that is 300 tips total. But during the months since I last posted (and you thought I was only slacking off...), I stewed over this list, wrote tips down as I thought of them, browsed through some things on Pinterest, did a little research, and checked back and forth through my other lists (so it wouldn't get repetitive). So, after all that, I'm feeling good about this latest list. Here's the thing about this list and the other two: lots of these suggestions don't seem like they'd make much of a difference on your budget. And that's true -- if you only do a couple, you may save a few bucks here and there. But, let me tell you, the more you apply to your life, the more you will notice a difference. I can totally attest to the way little actions add up and help your bottom line. So, without further ado, here is the list! 1. Be honest about your budget and money-saving goals. Tell your family, friends, coworkers when things don't work with your budget. There's no shame in trying to live within your means. If anyone gives you any grief, just remember what Dave Ramsey (my personal finance guru) says, "the goal is not to be normal, because...normal is broke." 2. Wash plastic zipper bags. As I read over my previous lists, I couldn't believe I hadn't mentioned this tip. It's like the classic frugal lady thing to do. Now before you think I'm nuts, I don't wash every single zipper bag my family uses. I don't reuse bags that have held meat or other wet/sticky/gooey things, but if I've stored dry items in them like pancakes, waffles, bread, vegetables, etc., I always rinse them out and reuse them. And since I haven't used paper towels in years, I use my old paper towel rack as my plastic bag drying rack. 3. Every list about saving money has this tip, but I'm totally going to add to the chorus: Get rid of cable TV. On my first list, I mentioned Netflix for cheap DVD rentals. But I wrote that list back in 2010, before the wonder of streaming video. Now, there are so many options to stream TV shows and movies (including ones on cable). Nowadays my family uses Netflix, Hulu Plus, and Amazon Prime to watch the shows we like -- and for way cheaper than cable would cost. 4. Do you garden? If you do, stick to heirloom varieties of fruits and vegetables and save the seeds from your garden produce. Last year, I grew a good portion of my tomato crop from the tomatoes I grew in 2012. This may just be the gardening geek in me, but there's something kind of thrilling about saving seeds that you would've thrown out or eaten and then growing more food from them. As mentioned above, this only works with heirloom seeds, not the hybrid varieties. For more info on how to save seeds, this book is a helpful resource; for the method I used to save my tomato seeds (it takes a few more steps, but is still easy), you can check out this link. 5. Speaking of seeds, it's a good idea to test seeds before you plant them. I don't test out my brand-new seeds, but I do test ones from previous seasons and ones that I've saved from my garden. That way, I don't waste time planting seeds that won't grow and I don't waste seeds that would grow. Often, people will just toss seeds from previous years just because the package says they're meant for a certain growing season. Testing seeds is super-easy -- you can find my step-by-step tutorial here. 6. Use nature to dress up your home. No need to buy expensive floral arrangements -- just head outside into your yard or neighborhood. In the winter, you could clip pine boughs, boxwood, or holly and put it into a vase. In the early spring, I'll usually put blooms from the pussywillow in my yard in a vase (without water -- that way, the soft buds stay on indefinitely) or force forsythia blossoms inside by cutting a unbloomed branch and putting it in water (you could also force blossoms from cuttings from fruit trees). In the summer, I like to make bouquets from the flowers and herbs in my yard; sometimes, I'll give myself a dozen roses from my rosebush. In the fall, sometimes an arrangement of leaves does the trick. I've even gone and clipped the weedy sunflowers that grow along the roads here and brought them home. 7. School book orders are a great source for cheap books. Often, you can find paperback versions of books that usually only come out in hardcover when you order from school book orders. If you don't have children in school and don't have access to book orders, ask a friend or a teacher you know. When my oldest started kindergarten a couple years ago, he started getting book orders and my friend down the street (whose kids weren't school-age yet) ordered books from them, too. I actually just talked to another friend a couple weeks ago who is a teacher and she told me how she gets credit for her classroom library the more people order. She said she'd love it if people she knew did book orders through her! 8. Meal-planning is one of the best ways to save money, but sometimes it can be daunting. One way I've made meal planning much easier is to do theme-nights. At my house, Mondays are soup/sandwich nights in the fall and winter (in spring and summer, it's salad/sandwich night), Tuesdays are for international dishes, Wednesday is fish night, Thursday features a slow-cooker recipe, Fridays are our pizza + movie night, and Saturdays are for leftovers or eating out (I don't plan Sundays because they're usually big family dinners at my parents' or in-laws' houses). You can read the post that inspired me to meal-plan this way at this link. 9. In my second list, I mentioned using military and teacher discounts, but failed to mention that there are lots of discounts for seniors and students. To get senior discounts, you don't always need to be 65+; lots of senior discounts start at age 50. As for students, I wish I would have known about a lot of these when I was a poor college student. To find a list of senior discounts you can go here and for student discounts, you can check out this link. 11. Don't turn your nose up at hand-me-down clothing, whether for your kids or yourself. Sometimes when we visit my in-laws' house, there will be a big garbage bag of clothes from one of my mother-in-law's friends. I'll usually only end up liking a few things, but, hey, free clothes! 12. Another way to save money on clothes: organize a clothing exchange. It can be with your family, neighborhood, church, any group. People clean out their closets and bring what they'd like to donate and then swap. 13. Skip the toxic herbicides like Round-Up and make your own weed killer. It isn't hard to make at all and only requires vinegar, salt, and dish soap. You can find the recipe I use and proof of the results here. 14. Pay attention at the check-out counter at stores. It doesn't happen too often, but there have been times when I've noticed that I've been charged twice for things. Of course, I've also had times when I haven't been charged for something and let them know - not only are they glad when I tell them, but it's good karma, right? 15. U-pick farms and orchards are a great source for inexpensive produce. Back in September, we picked delicious organic apples for 1.25/lb! It's a great activity to do as a family -- I had both of my boys, plus my niece and nephew, in on the action. There's something pretty satisfying about picking your own food. 16. Keep paper that is blank on one side for scrap paper. No need to waste new paper or Post-It notes. 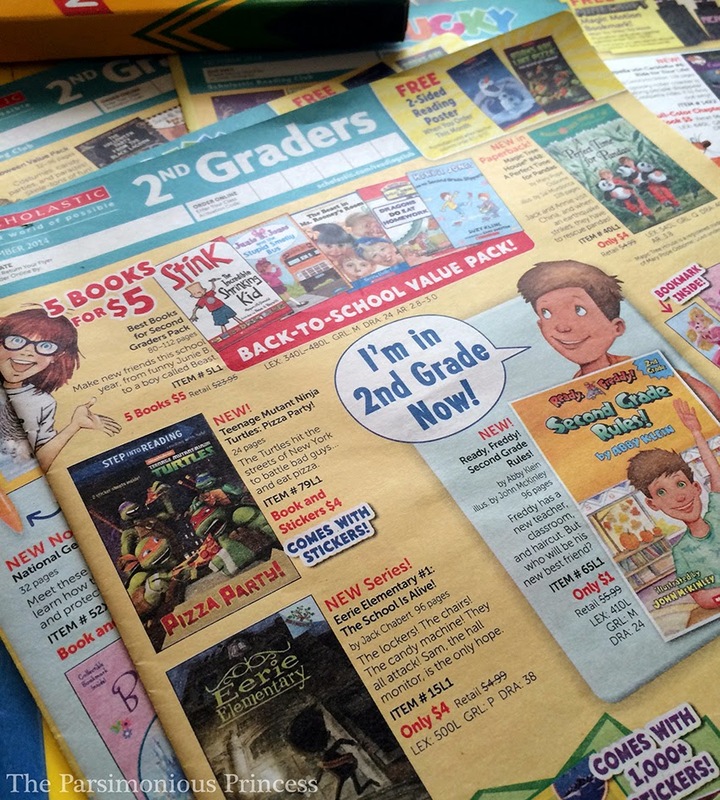 I remember when I was in middle school, the school collected all the one-sided used papers from the students (there were bins in every classroom) and then made it all into pads of paper that students could buy for super-cheap. You can make your own notepad from scrap paper -- this pin I found a while back shows how. 17. If you use Redbox, there are lots of codes for free rentals online. I work with the teenage girls at my church and for a service activity, we printed off a bunch of free codes and taped them to the Redbox machines to surprise people. Who doesn't like saving a couple bucks? There are lots of lists of codes; here's a list I found. 18. Let your lawn grow longer. Longer grass requires less water because the blades of grass shade the soil better so it doesn't dry out as fast. 19. In my second list, I mentioned re-growing green onions, but there are plenty of other foods you can re-grow from scraps. This year, I planted a few ends of romaine lettuce and it totally worked! My mom also tried this with celery with equally good results.You can find a handy how-to chart here. 20. Meat can be expensive, especially if you're trying to buy sustainable, local meat. One way to save on meat: buy a whole animal. I have yet to do this because I don't have a separate freezer (I know, what am I thinking? Just trying to find some space for one. ), but I want to. If you don't eat a lot of meat, considering splitting with family members or friends. I'm thinking next year of splitting the cost with one of my brothers or my parents. For an interesting post on the process I found, you can read here. 21. Expecting a baby? A maternity band can extend your regular wardrobe through your whole pregnancy. When I had my second child, I wore all of my regular clothes my entire pregnancy because of that stretchy tube of fabric. Mine came from the maternity store, but I've seen tutorials on Pinterest on how to make them yourself, too. You can read about my experience with the maternity band here. 22. We limit our eating out and when we do go to a restaurant, we only drink water (well, except at Mexican restaurants -- it's had to resist horchata). Just skipping the soda or specialty drinks can save a good chunk of change. 23. Witch hazel is a wonderful (and cheap) facial toner. I've been using it for weeks now. At night, after I've washed my face, I'll put a drop of essential oil (I like to use frankincense) on a cotton pad and then some witch hazel. I love it. 24. 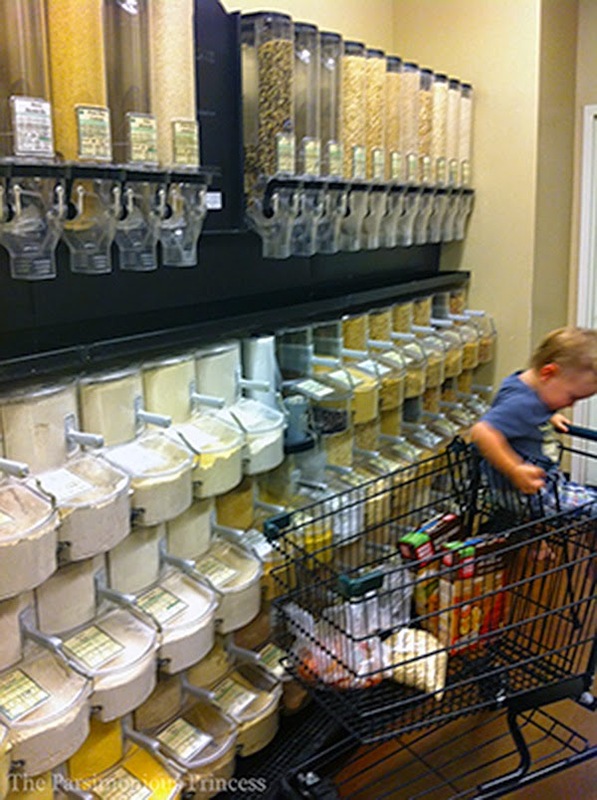 The bulk section at certain grocery stores can save you a lot of money on pantry staples. I've mostly seen the bulk sections at health food stores like Whole Foods, but they are becoming more common (like at WinCo). The bulk section is cheaper because you don't have to pay for the packaging. I buy my various flours, nuts, popcorn, spices, seeds (like flax and chia), sucanat, and oats in the bulk section for much cheaper than it costs packaged on the shelf. 25. Another tip about grocery shopping: try to go grocery shopping less often. Set a goal to only go once a week -- no little trips to pick up extras. I know all too well that a quick trip into the store for one or two items can evolve into a whole shopping cart full of things. Do that too often and it adds up! Once you've got once-a-week shopping down, see if you can work your way down to biweekly or even monthly shopping trips. 26. Do you have a gamer at your house? I most certainly do -- my oldest son plays a couple games, but the main gamer in my house is my husband (who also happens to make video games for a living. Hooray for Disney Infinity!). The Playstation Plus program is a great way to get games for cheap. It costs $50/year. Every month, my husband gets two free games per platform. That means he gets two games for our PS3, PS4, and Vita each; that's six free games a month and 72 a year! Even if you just have one platform, that's still 24 games a year. Now, my husband is not always interested in the free games that are offered, but he likes enough that the Playstation Plus membership more than pays for itself very quickly. And they don't just offer obscure games to members -- recently, members were offered the newest Tomb Raider game. There are other memberships for different consoles like Xbox and Nintendo, but I'm not as familiar with those. 27. While we're on the topic of video games, use stores like GameStop to sell and trade your video games and pick up used games that cost less. 29. Make your own spice mixes. I love Pioneer Woman's taco seasoning and use it a lot. Another one to make yourself is pumpkin pie spice. 30. This Christmas season consider replacing your incandescent Christmas lights (both indoors and outdoors) with LED lights. It's a bit of an investment because they cost more than the cheap strands of incandescent lights, but they totally pay for themselves. LED lights will not only last much longer than the incandescent ones, but they use less energy. Less energy used = lower energy bill. Check out this site to see charts showing the savings of using LED lights -- there is a HUGE price difference. 31. Grow your own garlic in your garden. 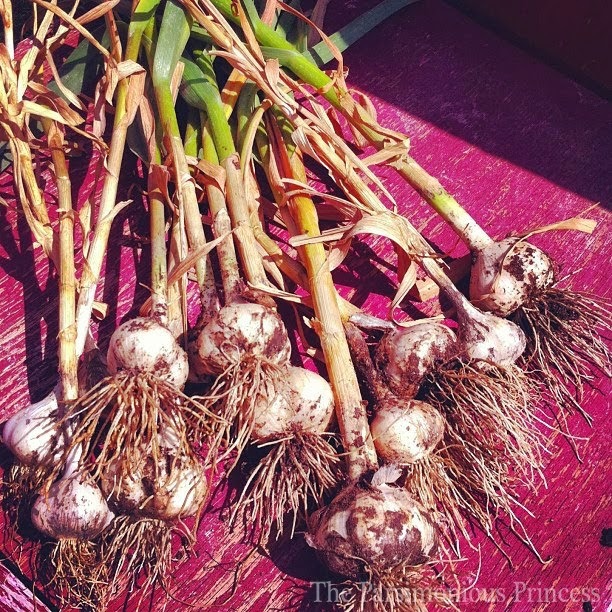 It's so easy to grow and homegrown garlic tastes amazing! You might still have time to plant yours, depending on where you live (I'm planting mine this week). For my post about how I grew my garlic, you can read here. 32. Another tip I can't believe I didn't include on the other two lists: skip soda. If you buy a $5 case every week, that adds up to $260 a year. Plus, you'll save money later on in life when you don't suffer from the health risks associated with too much soda consumption. 33. Did you know you can fix broken underwire bras with moleskin? No more stabby bras! 34. When driving long distances, use cruise control to save gas. Using cruise control can save up to 14% on each gallon of gas (the average, though, is 7%). The only time cruise control isn't a wise idea is when driving in the mountains -- all those up and downs can be hard on your engine. 35. Instead of buying the canned stuff (which is usually full of junk anyway), make your own enchilada sauce. It is crazy-simple to make and tastes waaay better than the store-bought variety. Oh, and it's cheap (around 80 cents per 2-cup batch). The recipe I use can be found here. 36. Curling your hair without heat can actually save you money. Heat-less curling eliminates the need to buy an arsenal of tools and hair products, like curling irons, wands, flat-irons, or heat-protectant sprays. Heat-free curling also save you money because it's easier on your hair and undamaged hair means less trims, cuts, and trips to the salon. For ideas on how to curl your hair without heat (and even while you're sleeping), check out this post I wrote about it. 37. Before purchasing online, check sites like retailmenot.com or freeshipping.org for coupon codes. 38. Before going to the grocery store, check out Lozo.com. You simply enter your grocery list and the site finds coupons for the things you're going to buy. 39. Forget store loyalty and shop at multiple stores. There are stores that have better deals than others on certain items. This where keeping a price book really helps (see #70 on my first 100 list). It takes a little extra planning and bit of extra driving, but it's usually worth the effort. I plan my grocery shopping so that I don't have to make special trips to four different stores every week. For example, I only shop at Costco and Trader Joe's once a month, so when I go I stock up on the best buys from those stores so I'll have enough to last the month. 40. When fruits and vegetable start to look a little iffy and wilted, freeze them before they spoil. I use this tip most for berries since they start going bad so quickly. It's a good idea to blanch your vegetables before freezing them because blanching them stops the enzyme process that is breaking the food down. You can find a helpful chart on how to blanch and how long to blanch certain veggies here. 41. 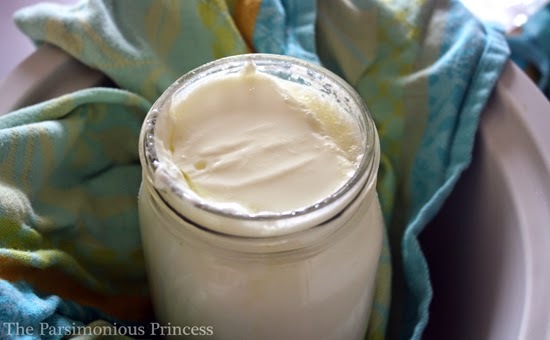 Making your own yogurt is surprisingly easy and inexpensive. I made a quart of yogurt for $1.50 (and that was using organic milk, which costs a little more than regular). No special yogurt-maker needed, either -- I use my slow-cooker. Learn how to make your own at my post here. Once you make your own yogurt, you can also make Greek yogurt and, even better, homemade frozen yogurt (which is transcendent) -- tutorial and recipe can be found at my post here. 42. Extend the life of your mattress by flipping and rotating it regularly. I like this helpful way to remember which way to flip and rotate. 43. When you use your clothes dryer, try to dry loads of clothes back to back. This appliance uses a lot of energy (about 13% of a household's average use) to heat up, so loading it again when it's already warm can save on energy costs. 44. I feel like I'm wading into dangerous territory here, but don't be afraid of the re-gift. Granted, this needs to be done carefully, so as not to hurt anyone's feelings. That said, I'll admit that I've passed on items that I knew I wouldn't use and have given them to people who I knew would enjoy them (and they totally did!). Just don't do it the way someone did when my husband and I got married: I will never forget opening one of our wedding presents (an ugly dish set from the early to mid-90s) that literally had a layer of dust on the box. I'm sure the people who gave it to us just went digging around in their basement for something to give away. So, yeah, this tip ventures dangerously into cheapskate territory. Use it with caution. No one wants to be called, with an accusatory finger, "a regifter." 45. Foraging is a great way to get food for free. It's gotten pretty popular lately and there are all sorts of books on the topic. This past summer, my youngest brother went with a friend up to the high mountain area by my hometown and picked morel mushrooms. They got a lot of them and when you consider that morels cost anywhere from $30-50 a pound, they got a pretty amazing haul. 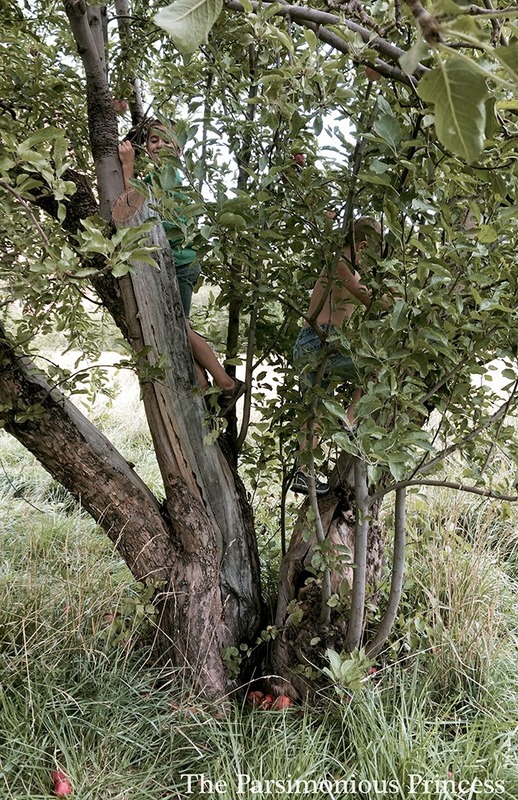 But you don't have to high-tail it to the mountains to forage for food - urban foraging is popular, too. Before you do go out to forage, it's a good idea to do your research or go with someone with experience (like my brother did) so you don't pick something gross or, worse, toxic. 46. Make your own facial masks and scrubs. It's ridiculously easy to do and there are all sorts of recipes for them on Pinterest (you can find some of the ones I've pinned here). One that I've really liked was a simple facial mask made out of oatmeal, milk, and honey (no exact measurements, just mix the ingredients until it forms into a paste) -- it's supposed to help remove blackheads and it actually made my skin feel tighter and softer. 47. Earning college credits is much cheaper if you do it while still in high school. If possible, encourage your high school-age children to take concurrent enrollment and Advanced Placement courses to help save on college tuition costs later. When I was in high school, I paid a small fee and through concurrent enrollment I was able to get college credit for classes I was already taking. I also took an early morning class via satellite at my school (though the credit ended up not applying to my degree...womp womp). Also, for a small fee for the test (I think it was $50, but that was back in the 90s), I took both the AP exams for U.S. History and English and passed, which eliminated the need for me to take some of the introductory history and English courses once I was in college. Although I didn't quite do it, it is totally possible for a high school student to earn their associate degree before they even have their high school diploma! 48. Another way to save on college tuition is to attend a college within your home state. As of this writing, the average cost of tuition and fees at an in-state public university is $8,893 per year. Once you cross the state line, the average cost for a public university is $22,203. That's almost triple the cost for just for leaving your home state! 49. 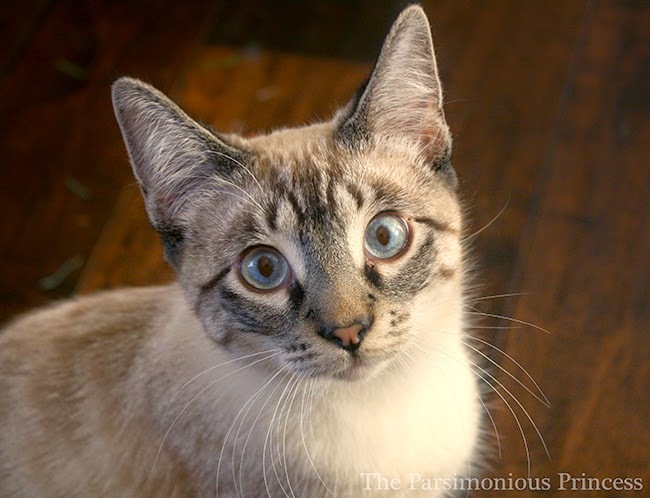 Looking to add a furry friend to your family? Adopt a pet from the local animal shelter or Humane Society instead of the pet store or a breeder . Not only is it cheaper (and sometimes even free) to adopt from the shelter, but often the animals there have already been spayed or neutered (as was the case with our cat). The best part of adopting a shelter animal: you may save a life! We adopted our super-sweet kitty, Mr. Cairo, from the local Humane Society two years ago this month and we could not be happier with him. 50. Experiment with the amounts you use when it comes to hygiene products. You don't need to have a long ribbon of toothpaste on your toothbrush like they show on commercials. I know I use too much shampoo and conditioner (I'm still used to having almost waist-long hair and get a big palmful of shampoo), so I'm trying to use less. See how well things work when cut your amount in half and experiment and adjust from there. 51. OverDrive is a great way to borrow e-books and audiobooks from your local library. You can read my post about it here. 52. Upgrade your appliances to energy-saving and water-saving ones. This is one of those spend-to-save tips, but you truly can save money in the long-run by replacing them. 54. When planning a vacation, try to book your flights and hotel stays on weekdays. Leave on Thursdays, not Fridays, and come home on Mondays, not Sundays, if possible. 55. When booking a hotel, stay in a hotel that serves a complimentary breakfast. Makes such a difference in your food budget. Do a little research, though, to make sure their breakfast isn't terrible (like a hotel we stayed in once by Disneyland. Our breakfasts were days-old pastries, orange-green oranges, and mealy apples. Yuck.). 56. One more travel tip: travel in the off-season of where you're going to go. Not only does it cost less, but the crowds are smaller, too! 57. Have you heard that you can sharpen disposable razors with a pair of jeans? I just learned this tip. Now, my husband hasn't used those disposable cartridge razors in years (you can read my posts about traditional wet shaving here and here), but I still use a disposable razor (it's a little trickier to use the double edge razor on legs and underarms). You can watch a tutorial on YouTube here. 58. Purchasing memberships to local zoos, museums, and aquariums that you visit regularly can save you money in the long-run. Usually, the membership pays for itself after a couple visits. Take the new aquarium in my area: for adults it costs $15.95/visit and $10.95/visit for kids; a year-long family membership costs $150 (which covers two adults and four kids). One visit for my family of four costs $53.80. By the time we hit our third visit to the aquarium, the cost of the annual membership will have been covered (if we filled the quota for the membership with four kids, the membership would pay for itself in two visits). After that third visit, it's like going for free every time. My family has annual passes to local museums and the aquarium and we love them. 59. Cancel magazine subscriptions that you don't read. I know from experience how easy it is to keep a subscription going because you have intentions to read that pile of Martha Stewart Living or Real Simple, but they end up still going unread. That's when you pull the plug and cancel those subscriptions. There's a good chance get like 100 notices (okay, I'm exaggerating, but it feels that way) from the magazines, letters that say that you're going to get the very, very best offer ever if stay on their mailing list. Ignore them. 60. 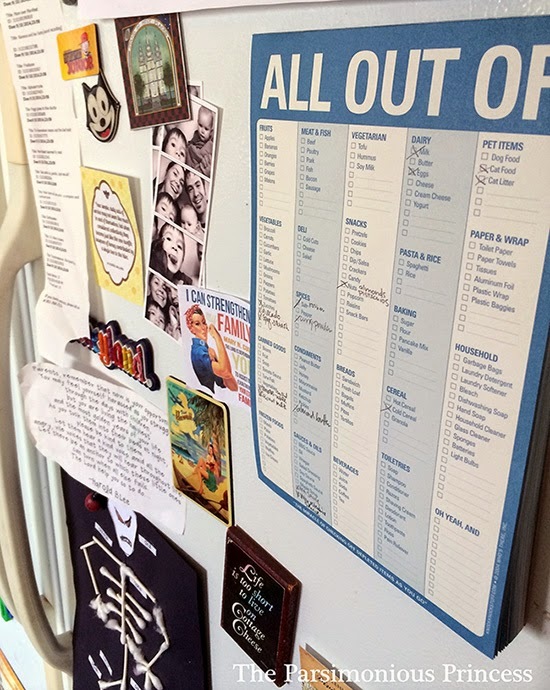 Keep a running list for groceries. As you run out of something, make a note. It's so easy to use the last of a jar or bottle of something and then forget to replace it when you make your shopping trip later in the week. If you keep a running list, you'll remember those little odds and ends and avoid extra trips to the store to pick up one thing that usually end with much more than that. I use this one -- it has a magnet attached to the back so I can keep it on my fridge. 61. When fruit gets too ripe, dehydrate it -- either with a dehydrator or your oven. Fruit leather is super easy to make. I use the master recipe from one of my favorite cookbooks, The Homemade Pantry (you can find a couple variations of her recipe here). Or you could make apple chips - another easy way to use up fruit before it spoils. 62. I just learned that you can wash and reuse disposable swim diapers. Of course, this only applies if they have only been wet. (Throw them out if your child has gone #2 in them. And you have my sympathy -- few things worse than changing a poopy swim diaper. I know all too well.) You can read all about this tip here. Of course, I learned about this trick once my little guy was potty trained and stopped wearing swim diapers. 63. It may sound kind of nuts, but don't throw food away just because it has passed the best-by and sell-by dates stamped on it . Those dates are more like guidelines, not hard and fast rules. You can eat food safely when it passes those dates. Lots of people (myself included before I knew the guidelines) waste a lot of food because they think those dates are expiration dates. Trust me, they're not. You can find out more about what the best-by and sell-by dates mean in a post I wrote here. 64. Once you know what sell-by dates mean, look for food at the grocery store that are almost out-of-date. I've gotten really good deals on meat and dairy just because the sell-by date was either that day or only a day or two away. 65. Consolidate the errands you run into one trip. This not only saves money on gas, but it also saves you time, too. 66. Switch from your bank to a credit union. Since members of the credit union are the owners, there are significantly less fees than with a bank. Plus, credit unions often better interest rates on checking and savings accounts than banks do, too. 67. One way to feed babies frugally: baby-led weaning. Basically, instead of giving babies special baby food, you let your child feed him/herself what the family is eating. The term "weaning" in this sense doesn't mean to stop nursing; it actually follows the British sense of the word, which means to add complimentary food. No need for jars of baby food or special cereal. With my first child, I totally bought boxes and jars of baby food until our pediatrician said it wasn't necessary. So with my second child, I just gave him what we ate (for the most part) once he showed interest in what we were eating (of course, keeping in mind certain guidelines, like avoiding honey). Funny thing is, at the time I didn't know there was a term for what I doing. For more information about baby-led weaning, you can check out this site devoted to the topic. 68. Get the most out of that basil plant by propagating it. By using this method I found, you can grow a whole new basil plant using a single stem! From what I understand, you can use this method with other herbs like oregano, lemon balm, and mint, among others. 69. Making an extra mortgage payment a year can save you thousands, if not tens of thousands of dollars over the life of your loan. There are a few ways you can do this, whether it's putting an extra $25-50 a month toward your principle, adding a lump sum toward your principle once a year (like around tax refund time), or setting up biweekly mortgage payments. You really should check out this informative article I found about how to make an extra payment; I especially like the article because it does the math and shows you how that extra payment can save you a lot of money in the long run. 70. Make your own dry shampoo. It requires only two ingredients and takes almost no time to make it. To find out how, check out this blog for the details. 71. Frozen fruit and vegetables at the grocery store are a great way to get healthy produce cheaper. These fruits and vegetables are picked at the peak of freshness and flash frozen. So not only are frozen fruits and vegggies just as healthy as fresh produce (if not healthier), but also less expensive. I love buying produce this way because I don't have to worry nearly so much about it going to waste because it got rotten. 72. Avoid buying clothes that are "dry clean only". 73. Shop your own house to update rooms of your house. This is a tip I learned from the book The Nesting Place. For instance, that lamp in your bedroom might be just what your living room could use. It's funny how something you see every day in one part of your house could be just the thing that breathes new life into a different area of your home. 74. YouTube is a great (and free!) source for DIY tutorials. For example, my husband used YouTube videos to help him fix both our washer and dryer. Doing that saved the cost of hiring a repairman or, worse, replacing the appliances completely. 75. Refrigerator pickles are really easy and cheap to make -- and they're really delicious. No canning required. 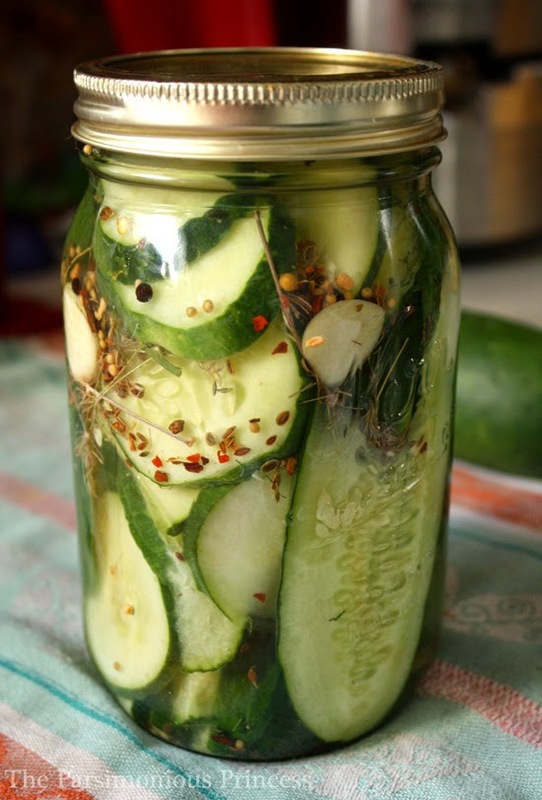 You simply mix up the brine, add cucumbers, and let them sit in the fridge. Once you eat all the pickles, simply add more cucumbers to the brine, let them sit for a couple days in the fridge, and, voila!, more pickles! You can find the recipe I've used at this blog. For what it's worth, when I made them the first time, my husband declared that they were the best pickles he'd ever had. 76. Garbage Soup, AKA using up the wilted, forgotten produce in your fridge to make dinner. Check out this post from Nom Nom Paleo (where I first heard the term 'Garbage Soup') for the details on concocting a pot of it. 77. The concept from #76 can also apply to smoothies and juicing: when fruits or veggies start to go past their prime, throw them in the blender or juicer instead of throwing them in the trash a few days later. 78. Make your own cake flour. No need to buy a whole box or bag of cake flour for recipes you'll only make now and then. You can find the crazy-easy tutorial from one of my favorite blogs here. 79. For a cheap clarifying shampoo, just add baking soda. Instead of buying a separate shampoo to remove all the excess build-up from things like hard water, products, and the environment itself, simply add a little baking soda to the amount of shampoo you're going to use at that moment (that means don't add it to the whole bottle of shampoo, just to the amount in your hand). The coarseness of the baking soda strips away all the build-up. I do this about once a week or so and every time I do, my hair looks and feels so much better! 80. Skip the store-bought calendars and just print your own off at home. I print off one every month and stick it on my fridge. I particularly like the free printable calendars at The TomKat Studio -- I've used theirs for the last couple years. 81. Instead of buying new furniture for your home, makeover furniture you already have with new knobs, upholstery, covers, shades, paint, or finish. It's amazing what a difference a coat of paint or new fabric can make. 82. Don't waste water when you're waiting for the hot water in the shower or bathtub. If running a bath, plug the drain right away. The cold water will balance out with the hot water that comes later. When showering, let the cold water run from the tap into a bucket or watering can until it gets hot, then start the shower. I totally get if that tip about the shower seems a little silly to you, but collecting that water in the shower (which really adds up fast, by the way) was what allowed me to water my tomato and flower pots outside in the summer of 2013 when we had strict outdoor water restrictions. 83. Limit the number of baths you take and take showers instead. Showers use much less water and energy than baths. An average bath uses 35-50 gallons of water (an average shower uses 10-20 gallons) and a hot shower uses only 20% of the energy it takes to run a hot bath. Treat baths like a treat. 84. Shorten your showers. I'd feel like a huge hypocrite advocating the super-fast Navy shower (more power to you if you can do it), but just cutting 1-2 minutes off your shower can make a difference, saving around five gallons of water. When you consider, as mentioned in #83, that the average shower uses about 10-20 gallons of water, five gallons is a pretty good fraction of usage. 85. 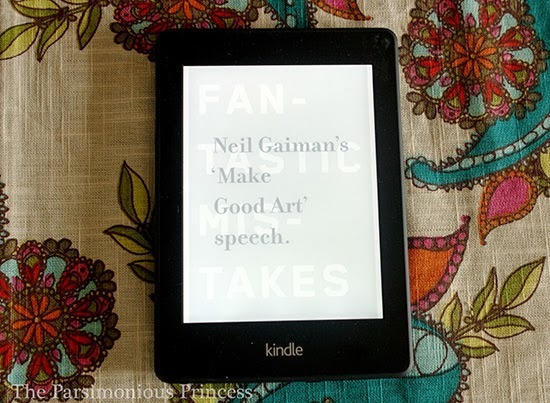 Do you use a Kindle or other kind of e-reader? In many cases, book downloads are much cheaper than the hard copies. And you don't have to worry about missing out on good deals because there are people who keep track for you! One of my favorite blogs has a regularly updated list of Kindle deals, most of the books featured costing less than $5. 86. While I'm on the topic of downloading books, classic book titles are public domain, so they're often free to download from sites like Amazon and if they do cost anything, it's only a couple bucks at the most. Public domain titles are ones from authors whose intellectual property rights have expired. These authors include people like William Shakespeare, Jane Austen, Victor Hugo, the Bronte sisters, and many, many more. This means you can download some of the greatest works of literature for free. That said, romantic that I am, I still buy hard copies of classics for my home library, but it's nice to have them on my Kindle, too, so I can take them with me anywhere easily. 87. Preserve your herbs, whether they come from your garden or the store. You can find a full post on how in my post here. 88. Pre-bagged produce is quite often cheaper than loose produce. By pre-bagged, I don't mean the pre-cut or pre-washed bagged produce (like baby carrots or salads). The pre-bagged produce I'm referring to includes things like the 2-lb. bags of whole carrots, the 5-lb. bags of onions, or 10-lb. bags of potatoes. Check the price of the loose produce, do a little math to see how much it would cost to buy the amount in the pre-bagged version of the fruit or vegetable you're getting, and then decide. 89. When you do buy pre-bagged produce, pick the heaviest one and weigh it. Often, the people who pack those bags will add more just to be extra sure they meet the weight requirements. Since the pre-bagged produce is sold by the unit and not the pound, you can sometimes get a little more for free. 90. Instead of buying packaged lunch-meat in the refrigerated section of the grocery store, buy it at the deli counter. There, they'll slice whatever amount of meat you want, how you want it sliced. I often buy sandwich turkey and ham that way, as well as pepperoni for homemade pizza. 91. Shred your own cheese instead of buying the pre-shredded bags of it. If you look at the unit price between the blocks of cheese and the pre-shredded bags, you'll see that there is a big cost different. Grate your cheese either the old-fashioned way with a box grater (still how I shred mozzarella) or do it super-fast with the grater attachment of a food processor. 92. Know the best times to buy things: clothes, cars, electronics, tools, and more. Check out this helpful calendar I found to help keep track of all the different dates. 93. The biggest water user in your home: the toilet (as much as 27% of the water in your home is used here). Watch out for leaky toilets. A leaky toilet that runs all day into the bowl can waste hundreds of gallons of water. To check if you have a leaky toilet, add some food coloring to the tank. If you can see that color in the bowl within 15 minutes of not flushing, you have a leak. Such leaks can be pretty easily fixed and most often don't require the help of a plumber. 94. Actually do those online surveys at the bottom of your receipts. Yeah, they can be kind of tedious, but they can save you money. For instance, for five minutes of my time, I can get 10% off at Old Navy; that could easily be $5 saved in five minutes. I also get extra fuel rewards for completing the surveys from my local grocery store. 95. Make the most of natural light in your home instead of relying on electric ones. I always wait as long as I can before turning on the lights in the house in the evening -- this may be due in part to my money-saving goals, but also because I prefer natural light waaaay more (lights on in the daytime drive me nuts!). You can find a list of five easy ways to maximize light in your home here. 96. Seal your home for winter to save money. You can find a great post that I found about different ways to seal it here. 97. Eat out too much? You're not alone; it's a very common thing nowadays. And I get it. Some days are just crazy and it's so much easier to pick something up or go to a restaurant. That said, eating out can be a big budget-buster. 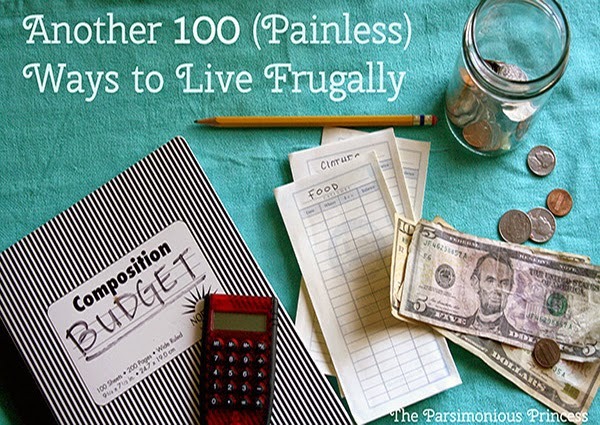 Don't worry: I'm not advocating eliminating eating out (this is a list of painless ways to live frugally, after all), but it's a good idea to cut back. I read a great tip to help you cut back on eating out: track how much you eat out for a period of time (a week, two weeks, or a month, depending on your habits) and then make a goal to cut that number half. That's not too painful, right? 98. Stockpile. Know what your households staples are, know the best price to get them at, and when you see that price, stock up. One smart idea I read somewhere is to set aside 10% of your grocery budget solely for stocking up on them items you buy most. 99. Repeat after me: If it sounds too good to be true, it probably is. I've known quite a few people who have gotten lured and pulled into all sorts of investment schemes, thinking it'll be a fast track to financial security. I've yet to see it work for someone. In all honesty, getting rich quick usually doesn't happen -- and even when it does, it can often be fleeting. Save yourself the money and heartache that comes along with get-rich-quick schemes. 100. Dream. Okay, that sounds kind of cheesy, but, seriously, make plans. Why do you want to be financially secure? What is your end goal? We have a lot of goals, but one of our dreams in particular is to travel with our family. 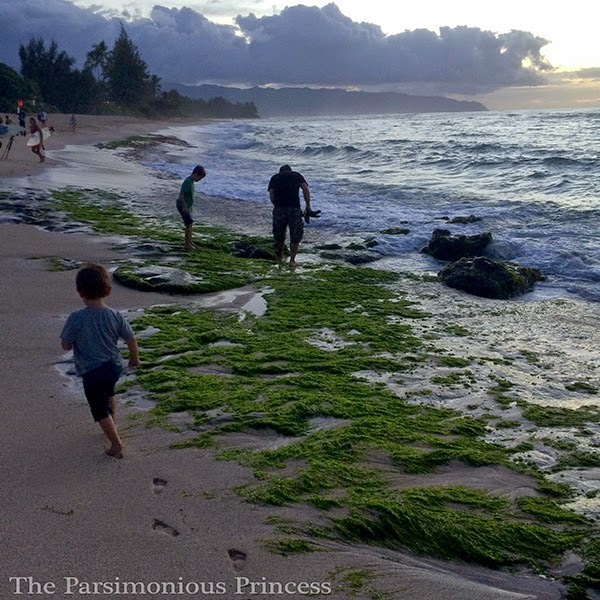 Last month, the four of us went on an incredible trip to Hawaii, completely debt-free. I'm not sharing this to brag at all, but instead to say that it came after a lot of hard work and sacrifice. It was our first big vacation in a long time (I hadn't even been on a plane since 2008) and it came after many long hours for my husband at work (both at his daytime job and doing freelance work at night) and from with me implementing many of the ideas on this list (and the other two). But, man, it was worth it. When you have a plan and a dream, it gives your work and efforts purpose and direction -- it's what keeps you going when it gets tough. Some fantastic tips here! We love OverDrive and, ahem, regifting but the latter only in a very classy, you'd never know kind of way. This is a great list of actual practical and useful ideas. So many time you find these lists of ways to save money, and they just don't have much value..."Sell your house and move closer to work to save on gas..." really? Thank you for this list - I will use a lot of the ideas I found here. My tip would be to skip Amazon Prime and just rent books if you're a college student - it's a lot cheaper and I wouldn't have a huge pile of books gathering dust in my room (they sell for less than $1 for buybacks and sometimes, were replaced by newer editions). Also community college is a great idea to save money. SO glad you are back! I love your posts! weight loss drugs 10 Effective Weight Loss And Fat Burning Exercises: Workout Motivation! - NDTV FoodSucking in your stomach hoping it will magically disappear? Want to fit into that gorgeous dress hanging in your closet? Desperately hoping you can pull off a swimsuit this summer? The only answer to your prayers, which you already know, is exercise. Like the wise say, there's nothing like starting today. Exercising is the best way to burn calories and build muscles, so don't make excuses. Instead, make progress. You need to take care of your body, and only you can make a difference. I'm not telling you it's going to be easy, I'm telling you it's going to be worth it. Look in the mirror, note: that's your competition. You have to do it for yourself.